Builders and developers continue to report credit easing for acquisition, development, and construction (AD&C) loans according to NAHB’s survey on AD&C financing. In the second quarter of 2013, the overall net tightening index based on the AD&C survey was -16.5, just slightly lower than the -20.5 reported in the first quarter 2013. The index is constructed so negative numbers indicate easing of credit; positive tightening. A similar net tightening index from the Federal Reserve’s survey of senior loan officers was -19.2 in the second quarter 2013, essentially unchanged from -20.9 in the first quarter. 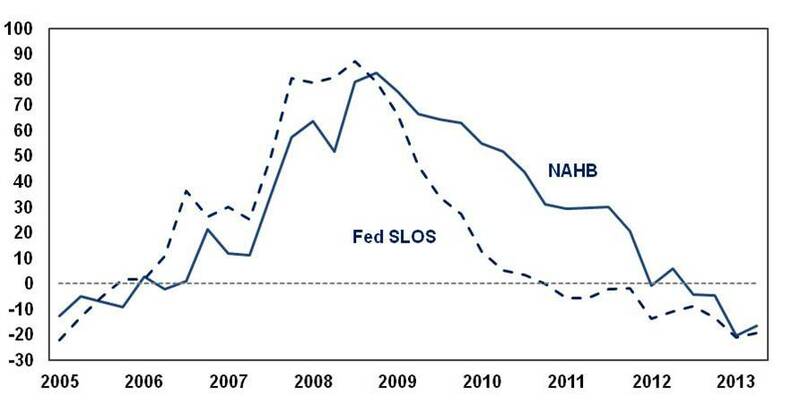 The NAHB and Fed surveys had diverged substantially, but have moved closer together recently and turned in the same direction in the second quarter of 2013. The continued easing in AD&C credit conditions is consistent with recent FDIC data indicating the stock of AD&C loans rose somewhat during the second quarter. According to the NAHB survey, the availability of credit for land development continues to improve. Only 10% of NAHB members said availability of credit for land development had gotten worse in the second quarter, compared to 37% who said it had gotten better. Only 9% reported worsening credit conditions for single-family construction, compared to 40% who said it got better. For land acquisition, and multifamily construction, NAHB members were closer to evenly split on whether credit conditions had improved or gotten worse. Among NAHB members who said AD&C credit conditions had in fact continued to deteriorate in the second quarter, the most common problems were lenders simply not making new AD&C loans (76%), lowering the allowable LTV (or loan-to cost) ratio (73%), the amount they are willing to lend (61%), and requiring personal guarantees or collateral not related to the project (58%). In the first quarter of 2013,”not making new loans”, “requiring personal guarantees or collateral not related to the project” and “lowering LTV ” were the most common problems, cited by over 65% of those who at that time said credit conditions had gotten worse. Although commercial banks remain the primary source of credit for AD&C by a wide margin, private individual investors have emerged as a viable alternative for some. Private individual investors were cited as the primary source of loans for land acquisition by 24% of NAHB members, for land development by 16%, and for single-family construction by 10%. In each case, private individual investors were the second most common source of credit. This entry was posted on Tuesday, September 3rd, 2013 at 8:30 am and is filed under Data. You can follow any responses to this entry through the RSS 2.0 feed. You can leave a response, or trackback from your own site.